I finished university quite early this summer so decided to begin a design project with one of my tutors, Chris Lim. I worked on this regularly in May and June, along-side a few other projects, before becoming busy in July with the set-building. I hope to continue with this project part-time after the set building finishes and term starts again. 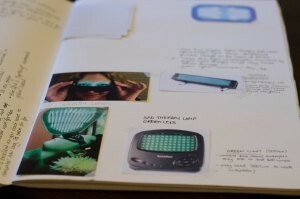 During our initial brainstorming sessions, we focused on a few key ideas such as the distinct medical aesthetic of many of the lamps currently being manufactured and the possibility of using LED bulbs which are much more energy efficient and environmentally friendly than the fluorescent bulbs used in most SAD lamps. We also spoke about what the criteria is so that a lamp can be marketed as a medical device under the UK Medical Devices Directive. Whist researching why people become affected with Seasonal Affective Disorder, I learnt a lot about something I’ve always found very interesting, the circadian rhythm. This bodily rhythm controls our energy levels throughout the day and is stimulated by bright light hitting the retina. Living in Scotland we have very little exposure to daylight during winter; especially when you factor in how we additionally stay awake late into the night using much duller, artificial lighting. This made me consider that it many not just be sufferers of Seasonal Affective Disorder (a diagnosed form of depression, which means that people can no longer live a normal life because of it) that could benefit from treatment as the bright light would also give normal people a boost in energy and, if timed effectively, could help us to regulate our energy rhythm (benefiting, for example, those of us who find it hard to get up in the morning through lack of energy). I am against the use of fluorescent bulbs because of their impact on the environment and our health, containing high quantities of mercury through which the current flows to light up phosphor particles. After conducting more market research, I found that many light therapy companies had a blue LED light product (such as the Philips GoLite Blu), claiming that scientific research has proven that blue is the perfect wavelength to stimulate the retina and affect the circadian rhythm. Whilst conducting my market research, I began to find definite contradictions in what manufacturers were saying worked in terms of light treatment. Each product description claims that their product is the most effective and that others do not work. 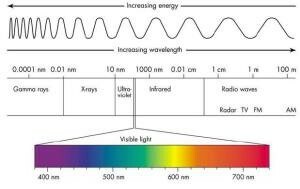 Some claim that white light is the only tested and proven method; some state that blue is the future of light therapy; and some even suggest that green light is, in actuality, the perfect wavelength. I decided to turn to scientific papers to find definitive answers to try to create a criteria for a lamp design that I could prove to work. Although the papers were tedious to read and many were not relevant, not to mention the difficulty I had accessing them without being a medical student, I managed to pick out a few key insights around which I could form a design. The optimum wavelength to stimulate the circadian rhythm is definitely blue, somewhere around 468nm and LEDs are definitely a viable option, having been used successfully in many experiments. I learnt quite a bit about the supposed “blue light hazard” which is damage to the cones in the eye caused by UV rays when the wavelength is too low. Many people online had written that this is a good reason to stay away from bright blue SAD lights but I learnt that the risk of damage is significantly reduced from 440nm upwards to a similar risk to that of ordinary daylight at 470nm. In terms of bulb choices it was the high power single LED bulbs (like the Luxeon Star bulbs) that seemed to be the most suitable because they could be used to achieve a high brightness; yet I still barely had any clues as to how bright a blue SAD lamp should be! Although some blue lights that I looked at didn’t even seem to have a number of lux in their description or in their technical information, such as the Philips GoLite, many appeared to still be market as 10,000 lux (the same brightness as is recommended for a white full spectrum SAD lamp). This doesn’t make much sense as, in theory, the bulbs could be a lot less bright because, if it’s only the blue light out of a full spectrum that counts, the light could emit the same amount of blue light photons and no other photons would be emitted resulting in no wasted photons and, through this, none of the wasted lux of white lamps. I found this a fascinating idea because a dimmer light would, not only be less irritating to the eye, but the light we designed could be much smaller allowing it to be more portable or possibly integrated into something else. Once I know the ideal lux for the lamp to be effective, I need to translate this into the number and type of bulbs required. I learnt that the intensity of light being emitted (the luminance, measured in lumens and sometimes photons per square meter) is different from the illuminance: the intensity of light hitting a surface (measured in lux). So to reach the eventual lux I had to figure out the calculations involved, including beam angle (125 degrees in the case of the Luxeon bulbs) and distance from the source. I’m still not 100 percent sure that, when other manufacturers talk about lux, they’re talking about how much light hits the eye as opposed to how much is being emitted. As a lot of light is lost as the photons are dispersed across the beam angle and the distance, the luminance will be very different from the luminance of a light. If the recommended brightness for a white SAD lamp must be 10,000 lux on the eye, then lights that only emit the equivalent of 10,000 lux at the source are not bright enough. Maybe the fact that most manufacturers specify a precise distance to place the lamp in front of your face indicates that they are calculating the illuminance of their device. It was at this point that I read a paper which made the matter much more interesting. The paper explained that lux wasn’t a measure of amount of photons being emitted, but a measure of brightness to the human eye; and the human eye is many times more sensitive to amber light than any other wavelength. That means that if you’re creating the same lux using a blue and an amber light, the blue is emitting many times more photons (and therefore using significantly more energy, the luminance is much higher) than an amber light (or a full spectrum light, containing a lot of amber light as most do). This meant that a blue light could be a much, much lower lux than a white full spectrum lamp, the experiment in that paper uses a lux of 45. Although I this is very interesting and opens up many possibilities for a design with just one or two tiny bulbs, I still want to find a definite figure for lux as the paper doesn’t give a reason for choosing that number and a few later papers I looked at had chosen completely different numbers (around 400). And this is where I’m stuck. Since this point I have read more papers and done more Google searches, but not found any solid evidence for a proven lux (or maybe photons per square meter emitted) with evidence that it works to treat SAD. I have stopped with my research here as I think that I am spending too long on this section when I originally set out to design something; although it has given me many very interesting points around which to base my lamp. I have really enjoyed doing it because if my interest in human biology and also just because I like doing things thoroughly. Next, I’m going to see if we can find somebody with knowledge on the subject to perhaps give advice or maybe we’ll make an informed guess at a number for the lux and design with that in mind. After all, it doesn’t have to be perfect as it is only a personal project. I ask myself what designers in the industry would do in my position, or if they’d even ever be in this position (would they just always be given the information by a research team of scientists?). All the same, I don’t feel like I’ve wasted this time and have definitely learned a lot from the process that I followed and also learned about collecting, reading, interpreting and comparing information from many different sources.